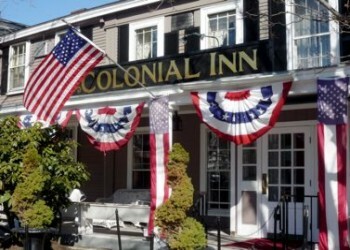 Located on Concord�s town common, the Colonial Inn has stood witness to history for nearly three centuries. The Inn�s main building was constructed as a private residence by the Minot family in 1716. During the period of unrest leading up to the American Revolution, one of the inn�s original buildings was used as a storehouse for arms and provisions for the town�s militia. During the battle of Lexington and Concord on April 19, 1775, the British Army was confronted by local militiamen at the nearby North Bridge and America�s War of Independence had begun. A century later, parts of the inn were used as a variety store and served as the town�s center of commerce. The Thoreau family took up residence in the house and Henry David Thoreau lived there while attending Harvard College. Later, the home served as a boarding house, then as a small hotel known as the Thoreau House. By 1900, the Inn was operating as Concord�s Colonial Inn and has since welcomed a diverse array of notable guests during the past century, including Franklin D. Roosevelt, Shirley Temple, Bruce Springsteen and Queen Noor of Jordan. The spirit of the past is vibrantly alive in the village of Concord. It was from here the local farmers and militiamen mustered to meet the advancing British troops on that fateful April day in 1775. Although perhaps most famous for its pivotal role in securing America�s independence, the town was later the epicenter of philosophy, literature and progressive thought in the mid-19th century. It was not uncommon to see the spirits of Ralph Waldo Emerson, Nathaniel Hawthorne, Louisa May Alcott and Henry David Thoreau strolling through town. Today, visitors enjoy the town�s rich history, colonial architecture and abundance of book stores, antique shops and quaint cafes. 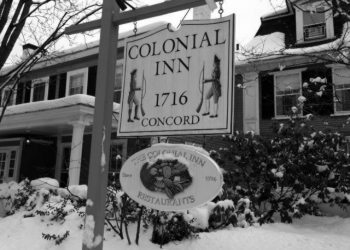 The Colonial Inn has been an integral part of Concord�s history and continues to delight visitors with its authentic charm, warm hospitality and an occasional visit from visitor long ago. "I have always prided myself on being a fairly sane individual but on the night of June 14 I began to have my doubts. On that night I saw a ghost in your Inn. The next morning I felt too foolish to mention it to the management, so my husband and I continued on our honeymoon. I wondered whether or not any sightings of a ghost had been reported or if any history of one was involved in the history of the Inn. The incident sounds very melodramatic. I was awakened in the middle of the night by a presence in the room�a feeling that some unknown being was in the midst. As I opened my eyes, I saw a grayish figure at the side of my bed, to the left, about four feet away. It was not a distinct person, but a shadowy mass in the shape of a standing figure. It remained still for a moment, then slowly floated to the foot of the bed, in front of the fireplace. After pausing a few seconds, the apparition slowly melted away. It was a terrifying experience. I was so frightened I could not scream. I was frozen to the spot . . . If you'd like a haunted room in our Inn, ask for Room 24. Paranormal activity has been investigated in other areas of the hotel as well. 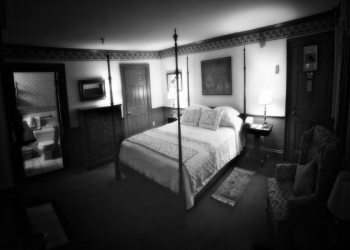 In early 2005, two organizations investigated at Concord's Colonial Inn: Ghost Images Paranormal Investigations and Spirit Encounters Research Team. Most recently Syfy's hit show Ghost Hunters did an hour-long episode on the Inn to explore paranormal experiences.